Thomas Nelson has created one of the better Study Bibles that have crossed my path. I find little wrong with this compilation of helps. The helps are indexed, they are presented in full color. The 500+ brief word studies scattered throughout the are helpful, lots of practical helps (“Truth in Action”), and an extra -long concordance (compared to most Study Bibles), all add extra value to this ne edition. I also appreciate the three ribbons included to provide bookmarks – not just the two that normally are included in most Study Bibles. Built with a nice simulated leather cover, the book feels solid and well-built. Concerns are minor and personal. 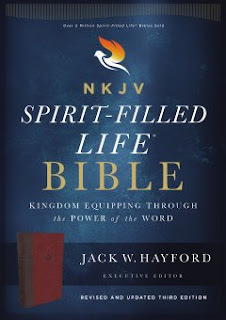 Though I am not a fan of Jack Hayford’s theology, this is a book that I am still glad to have in my library – it has valued thoughts from a leader of the church. Similarly, I am concerned about the choice to put Jesus words in red. I much prefer a Bible with all text in a common black font. Finally, all of the helps add considerable weight to this Bible. I can see this book being used at my desk, rather than being carried into church on Sunday morning. This would not be the first Study Bible I would add to my library – but it does belong there. This review is based on a free copy provided by the publisher for the purpose of creating this review. The opinions are mine alone.